We create eco-friendly quirky greeting cards and prints using both letterpress and lino print techniques. The Pear in Paper was founded in 2015 by Lynn Costello Erskine. We are based in County Donegal on the North West coast of Ireland. We create eco-friendly quirky greeting cards and prints using both letterpress and lino print techniques. 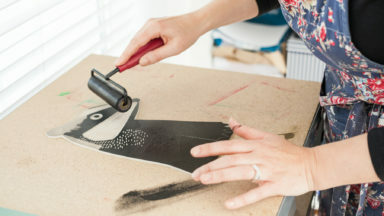 We began by creating a range of greeting cards and prints using the lino print process. This involves sketching an illustration, carving out this design on linoleum before rolling the raised surface with water based inks. Pressing this inked surface into card gives us our image. Then in early 2016, we found a 143 year old, unloved, rusty letterpress platen. Over 5 months, this beautiful letterpress platen was restored to its former glory. We are so proud and excited to know we have this letterpress platen in our care and it is being used as it should every day, without the use of electricity or battery. It is all manual, with a box of tools next to it to finely tune the printing as we go along. With a background in environmental studies, the planet was always going to be a core concern of our business. We take pride in our use of recycled, tree free paper goods and in our environmentally friendly ethos here at The Pear in Paper. We are inspired by nature and its conservation. We choose to print the old fashioned way using sustainable practices and production. Our card is tree free, our envelopes are 100% recycled and our protective, clear sleeves are made from corn starch making them fully biodegradable. Letterpress & Linoprint Eco-Friendly Paper Goods.